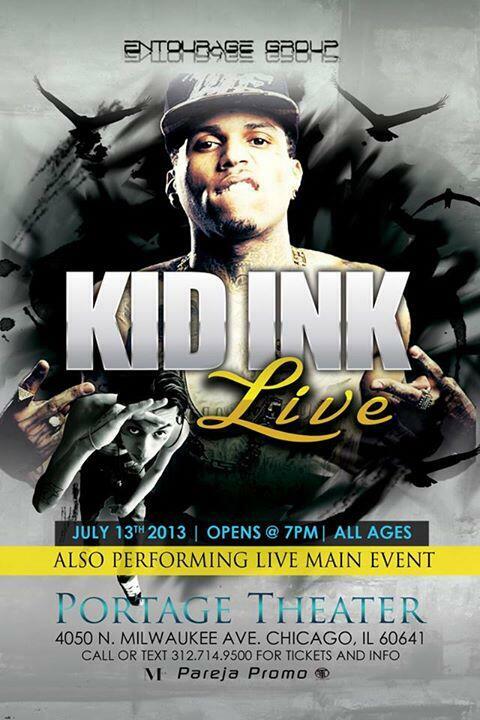 A little more than three weeks after pulling the plug on movies at the historic Portage Theater on the Northwest Side, controversial venue owner Erineo “Eddie” Carranza is putting tickets on sale tomorrow for his first musical offering at that venue: a show by Los Angeles rapper Kid Ink. Tickets to the July 13th show go on sale Wednesday for $25 through Ticketfly.com. It is being advertised as an all-ages event; Carranza is fighting the revocation of his liquor license at the Congress Theater and has not yet secured a liquor license at his second venue the Portage. Carranza had promised concerned residents at Six Corners that bookings at the Portage would be more in keeping with the neighborhood than the hip-hop and electronic dance acts featured at the Congress. It is open to debate how Kid Ink, born Brian Todd Collins and the author of jams such as “Neva Gave a F---,” “Lost in the Sauce,” “Crazy (Loco),” and “Rumpshaker,” fits that bill. Meanwhile, building code violations at the Congress are contributing to an ever-lengthening roster of canceled shows there, as reported by DNAinfo. The newest problem involves improper scaffolding on the first floor of the theater and work that was progressing without a permit. Once again, the city Law Department has ordered the theater closed until these problems are resolved. Among the canceled performances at the Congress: the Evolution Music Tour, rescheduled from last weekend until July 27; a show by Juanes on Thursday, and the Still Awake Afterparty show on Friday.